Finally made some changes to plug ParaJVE within its allocated panel. The emulator runs, its menu is accessible and functional, the keyboard events are hooked correctly, and the emulator can output its text in the embedded console panel. Apart from that all the other panels are dummy ... The register display is not linked to the engine, and all the other components are empty. You can't even bring the game selector at the moment (MineStorm is hard-coded, sorta). 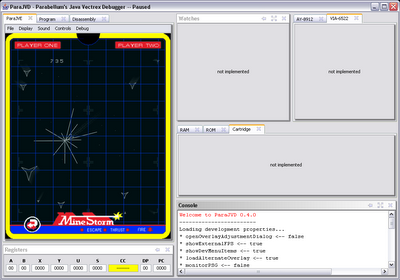 I guess the next step should be to make ParaJVE use the debug engine, rather than the runtime engine. The debug engine is a sub-class of the runtime engine, that can handles lots of debug events (breakpoints, running/stepping mode, ...).